Have a buyer looking for a LIVE/WORK space they can customize? Take a look at this! One of a kind rare opportunity! 3 story mixed use building in the shadow of Busch Stadium. Walk to Cardinal games from your home and/or business! Adjacent to the famous Broadway Oyster Bar. Wide open storefront on the main floor, 2 level apartment upstairs with roof access to build a deck with a perfect view of the Arch. The space is a blank slate ready to be custom rehabbed exactly the way you want it! Eligible for Historic Tax Credits to offset rehab costs. Brand new roof, Jan 2014. Paved concrete in back for a patio, additional parking, or even to possibly build a garage too! Perfect for your creative buyers with vision. Bring them to see to this unique property. Lots of redevelopment in the area including $100 million Ballpark Village 1st phase. Create equity! 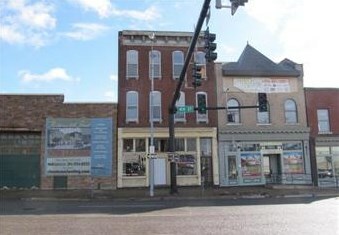 Ground floor opportunity to own a fantastic property in Downtown St. Louis!